As anybody who has read 'Travels With Back Chat' will have realised, Eugene and I are pretty passionate about food. We have eaten in many parts of the world and have come to think of French food as our spiritual home. So it is with great joy that we have become regular patrons of The Foodbarn' at Noordhoek. Franck Dangereux is the maestro who creates the magical meals. Originally at La Colombe, now at The Foodbarn, he is cooking for everyman and still maintaining the standards of a michelin star restaurant but without all the michelin hype. One can eat from a bistro menu, which allows 3 courses, or from the A La Carte menu. Both are seasonal and change often depending on the availability of fresh produce. Have you ever seen a Frenchman or a Frenchwoman choose fresh produce? Only the very best will do and don't rush them, it is a very serious and painstaking business. 'seared tuna served on potato fondant with smoked salt and a lime,ginger and Japanese seaweed broth'. I had a crisp garden salad to start and Eugene enjoyed and I quote "Chabri" goats cheese crumbed and fried, served on a fig and blackcurrant sauce, finished with roasted pumpkin seeds and a swirl of pumpkin seed oil." Homemade ciabbata, dipped into Foodbarn Olive Oil and Balsamic vinegar completed our first course. Eugene chose a carafe of merlot to enhance his meal. Then the tuna! Oh my, oh my, oh my! We both became very silent and concentrated on the tastes that sang on our palates. The tuna was firm yet delicate, the potato fondant crisp and light and the broth, a fusion of tastes, that allowed the taste of the tuna to dominate. We cleared our plates, mopping up what was left of the broth with the ciabatta. The desserts are divine, decadent and delicious and ideally everyone at the table should choose a different one and taste a bit of everything. Eugene chose a trio of sorbets, lemon, passion fruit and vanilla. Oh and the best news is that it is pet friendly, child and baby friendly and wonderfully informal. On lovely days, children can play on the assortment of climbing apparatus outside and there are tables where one can sit and watch them while enjoying a meal. There is also a menu for little people and remember that both Franck and his partner Pete, are young parents and understand the needs of future gourmands. 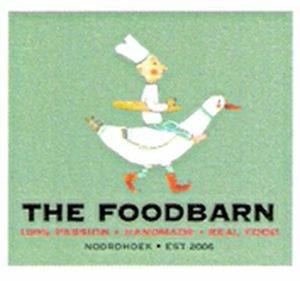 The Foodbarn is open for lunch and dinner from Tuesday to Saturday and lunch only on Sunday and Monday. Breakfast can be enjoyed at the deli a little further round the village green and a trip to the deli is obligatory. Pete de Bruin, partner in the Foodbarn experience, presides over the wonderful homemade bread, cakes, quiches and so much more, but that is for a separate article. Eugene and I love eating out and always pay for our meals whenever and wherever we go. This is our take on this wonderful place. We would love to share it with you. Sorry that you could not get a booking for Wednesday evening. Perhaps you could go onto a waiting list? I do hope that you will get lucky.